Once you purchased Bulk Pricing for WooCommerce, you’ll receive an email confirmation containing your license key and a link to download the plugin as a zip file. Download the plugin to your computer. Then go to your WordPress admin dashboard. Click on Plugin » Add New. Then click on the Upload tab. Browse for the file zip file you downloaded before and upload it. Click on Activate the plugin in the next step. Note: Make sure you have a recent version of WooCommerce installed. This plugin supports WooCommerce 2.0.x to 2.1.x. 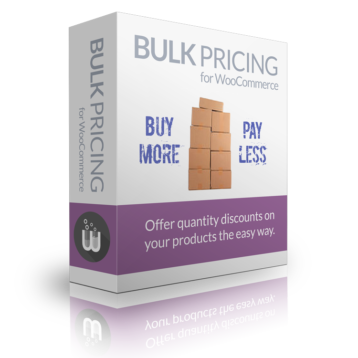 Great, You have successfully installed Bulk Pricing for WooCommerce! Now you’re ready to set up your discounts. You can set up product discounts in different ways. Using rulesets is recommended as it allows more flexibility and control over what happens when multiple discounted products are added to the cart.